First published in 2008, The Funeral Celebrant's Handbook book has become the trusted companion for qualified celebrants, church leaders and celebrants-in-training across Australia and beyond: the most informative work ever produced for existing and aspiring funeral aspirants. It covers every aspect of a service, beginning at the time of initial contact and the first meeting with the bereaved, right through to the service itself. In this book you will also find a varied collection of readings, poems and sample eulogies for each type of funeral service, as well as advice about conducting memorial services and funeral services with a difference. 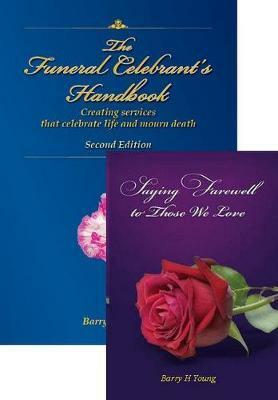 Following the success of The Funeral Celebrants Handbook Barry H Young was asked to write a companion volume offering choices of poems, prose and prayers to assist practising and aspiring funeral celebrants when planning a funeral. Saying Farewell to Those We Love begins with meaningful, relevant and heartfelt openings and proceeds logically through to the Committal and Benediction. There are passages suitable for funeral ceremonies for the elderly, middle-aged, teenagers, babies, tragic occurrences, suicides and the lonely; those who cut themselves off from society; those without family and those affected by illnesses and drugs. It provides tributes from husbands and wives, from sons and daughters, grandchildren and for those who have served in the forces. With its wealth of inspirational choices of readings it has also become a treasured handbook for celebrants. Barry Young OAM has been a member of the Australian Federation of Civil Celebrants since 1998, and a leading professional funeral celebrant of twenty years' experience. Being mindful of grief and the provision of comfort to young and old on his journey as a funeral celebrant, he saw a need for books to assist celebrants in making each ceremony unique and meaningful. Barry's funeral service structure and his creative meaningful writing style have put new meaning into what can be a solemn and heart-wrenching occasion. His book The Funeral Celebrants Handbook has been widely acclaimed around the globe and is an inspiring training manual and guide to those wishing to enter this significant and caring ministry. Barry was awarded an OAM (Order of Australia) on Australia Day 2008 for meritorious service to the community through support for a range of youth, service and aged care organizations and grief counselling. In 2013 he was awarded the NSW Government award for the Albury Citizen of the Year and in 2015 the City of Albury Australia Day Honour Volunteer of the Year award. Barry is a dedicated Rotarian and a recipient of a Paul Harris Fellowship. Barry lives with his wife Bev and family in the beautiful rural valley of Thurgoona in NSW.